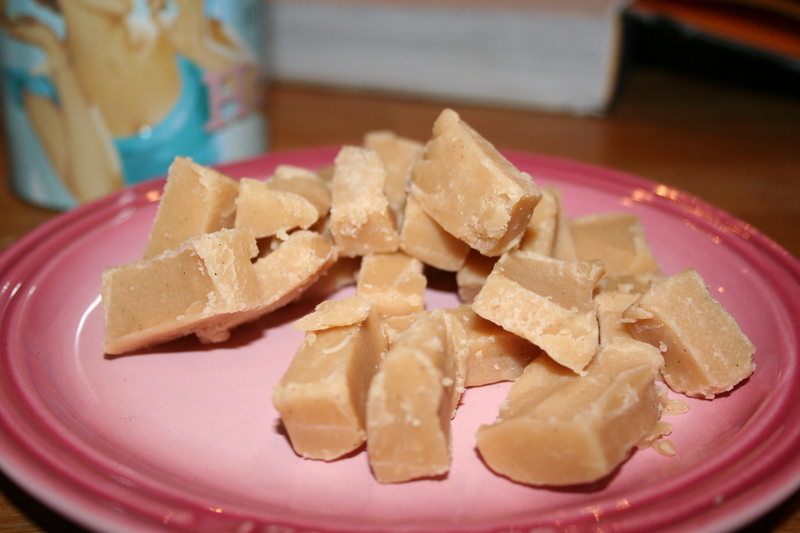 Have decided to make fudge this afternoon, mainly as a thank you to our lovely neighbours. I suspect I may have to make another batch or two to take to work and leave for the offspring. According to the river cottage book you need to lightly oil a 15 x 22 cm baking dish. I forgot to oil my dish once and the fudge stil lifted out beautifully once it was chilled. Patience here is the key, if you try and lift it to soon it won’t come out neatly. In a heavy base pan put your cream, sugar, syrup and butter. Make sure that these ingredients only go a third of the way up the pan as once this mixture is boiling it will bubble up a fair bit. Heat these ingredients together stirring all the time over a gentle heat until the sugar is dissolved and the butter melted. STOP stirring and place your sugar thermometer into your pan. Crank up the heat and watch closely. Once your thermometer hits 116 degrees C, take it off the heat and leave alone for 10 minutes. Ok, now you will need an electric whisk for this bit. The mixture needs to be whisked until the fudge becomes thick and slightly grainy. This can take up to 10 minutes but so far every time I have done this it has taken only a couple of minutes. Pour your fudge mix into your prepared dish, spread it evenly and then place in a fridge for a good 3 hours to firm up. When the fudge is still on the warm side you can mark out your squares to be cut up later but it is fairly easy to chop so worry not if you forget. 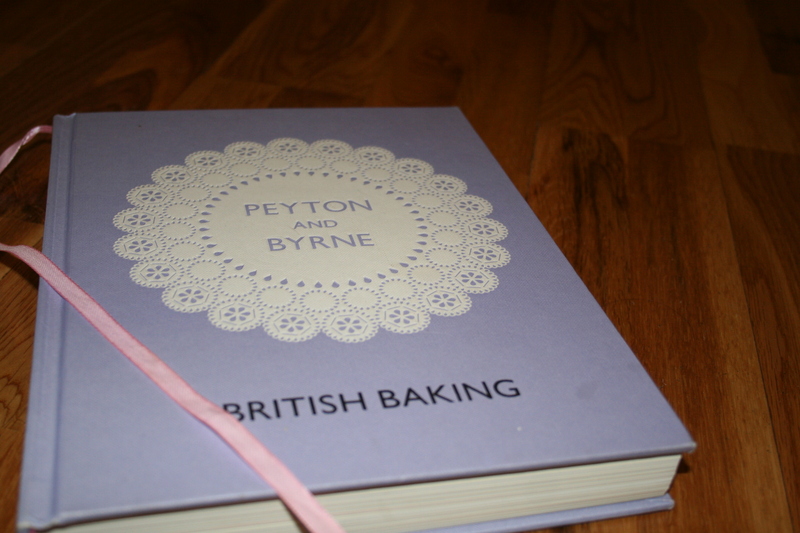 I purchased myself a copy of Peyton and Byrne, British Baking book. I was initially attracted to this book by the fabulous doily cover on a lavender background. It just looked so elegant. Was very happy to discover that the books interior was equally gorgeous, an absolute treat for the eyes. I have tried a few recipes in this book and am happy to report that so far they all test well. The recipe that I have been desperate to try has been the one for marshmallow teacakes but have waited and waited as I thought it would be too tricky. 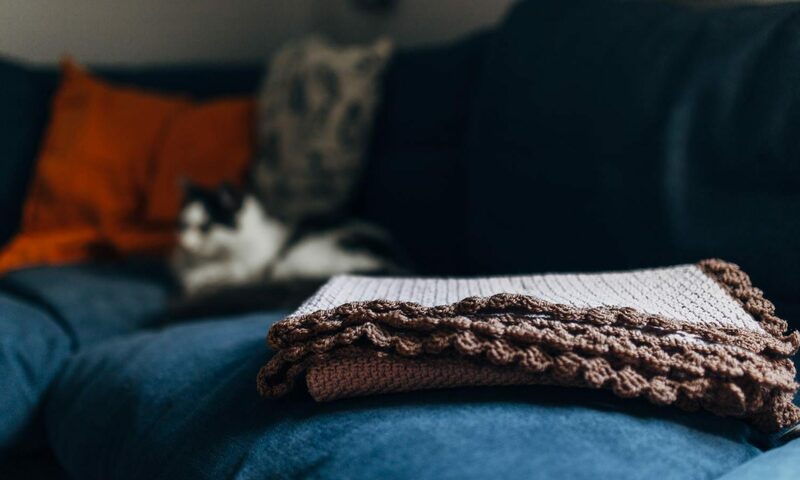 It isn’t too tricky to do but is time consuming. You will need a good hour to play with and be prepared to stir continuously for fifteen minutes at one point of this recipe. Another downside ( or not depending on your point of view! ) is that these babys need to be eaten the same day you made them. The recipe makes 12 so you will need to share, I cannot eat more than one!! Preheat your oven to 180 degrees C/gas mark 4. Line two baking trays with baking parchment. In a bowl, sift together your flour, bicarbonate, baking powder and salt. Put to one side. In another bowl beat the sugar and butter together until pale and fluffy. Then beat in your cream and add the flour mixture. Mix till combined, do not over mix. Using a couple of spoons, dollop 6 scoops of dough on each tray, spacing them well apart as they will spread a bit. Try and keep them even in shape as they will look nicer when cooked, Mind you mine were all sorts of shapes and still tasted good, so worry not! Stick them in the oven for around 10 minutes, take them out once they are just starting to go golden. Pull them out of the oven and leave them to cool completely. Right now you need to get on with your marshmallow filling. Put all of the mallow ingredients into a heatproof bowl and place that over a saucepan of boiling water. Whisk continuously by hand until the mixture is light and fluffy and the sugar is dissolved. This takes around 10-15 minutes. Once this is done take it off the heat and then using an electric mixer if you have one ( takes a bit longer by hand, and will build you some muscles ), whisk the mixture until it is white and thick and holds its shape. Put this mixture into a piping bag. Try and enlist the help of someone for this bit ( to hold the bag open ) as the mix is really sticky and difficult to put in an icing bag. Cut a large ish hole in your piping bag ( or fit it with a large plain round tip first ) and then pipe generous dollops of marshmallow onto your biscuits. Leave to set. Melt your chocolate. The book recommends melting half the chocolate over a double bolier and then adding the rest of the chocolate and letting the residual heat melt the rest over a period of around 7 minutes. Place your biscuits onto a wire cooling tray that has been placed over a sheet of baking paper. Spoon the chocolate over each teacake, but messy but pleasing. Leave to set! Again! This can take up to an hour so if you were planning to have these for afternoon tea I would probably make them in the morning. Well I hope it’s not too daunting a recipe, they really are worth the effort for a special occasion.